Apple's iTunes Match service, which allows you to take your entire iTunes music library to the cloud, and then stream it from everywhere for a price, has started appearing for international usage. Chances are that this rollout is still not official, since you have to go to your "Accounts" page to sign up for it, instead of seeing the option directly on the main page of the iTunes Store, but you can still get it if you are into all that streaming thing. 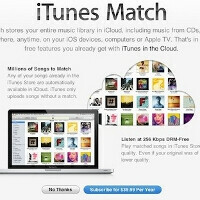 Users in the UK, some other European countries, as well as Australia and New Zealand are already reporting iTunes Match available in their markets for prices slightly higher than the local currency equivalent of $25 per year, which is the price in the US.